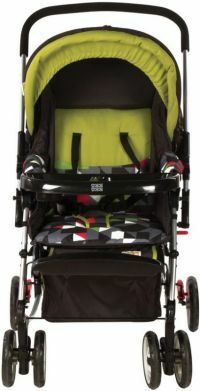 A pram is your child's luxury vehicle to discover the world one day at a time. Ensuring your child gets maximum protection from sunlight during daytime is Mee Mee's Fully Canopied Pram. 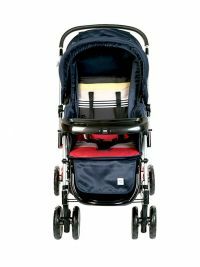 The back of the pram has a pouch for storing small essential items. Upper hood has a window through which parents can watch the baby. 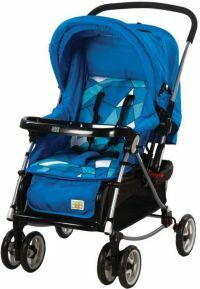 Full canopy and leg cover protects your little one from sunlight. Detachable glass holder to carry the child's feeding bottle or water on the go. A five point harness with a shoulder and waist belt provides maximum security to seated child. A double seat cushion that's detachable and easy to clean. Longer seat suited for naturally taller babies or for those babies gaining height rapidly. 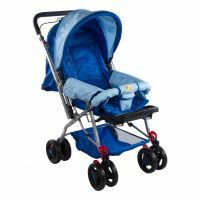 To Recieve updates and possible rewards for Mee Mee MM-26Pram(8027) Navy Blue please sign in. To Recieve updates and possible rewards for Strollers & Prams please sign in.